It’s a natural part of growing up for your child to feel some anxiety about being separated from you. Fortunately, there are some steps you can take to ease their anxiety, and with time, their symptoms should fade. However, for some children, separation anxiety becomes a long-term problem, so it’s important to understand it fully so you can support your child. Separation anxiety is a normal reaction of young children when separated from their parents. They may become clingy, throw temper tantrums, or cry when they are separated from their parents. This is a typical part of child development that generally begins around a child’s first birthday and may periodically remerge or be a consistent concern up until age four. As long as parents are patient and consistent, separation anxiety should fade with time. However, sometimes, children experience separation anxiety that doesn’t go away over time, even if their parents are taking consistent steps to help ease it. Some children experience separation anxiety into their elementary school career and even beyond. This can cause major interference with their success in school and in making friends. This is called separation anxiety disorder. It’s important to understand the distinction between “normal” separation anxiety and separation anxiety disorder. The main difference lies in the intensity of the fear, how far into childhood the anxiety lasts, and how much it impacts their functioning. 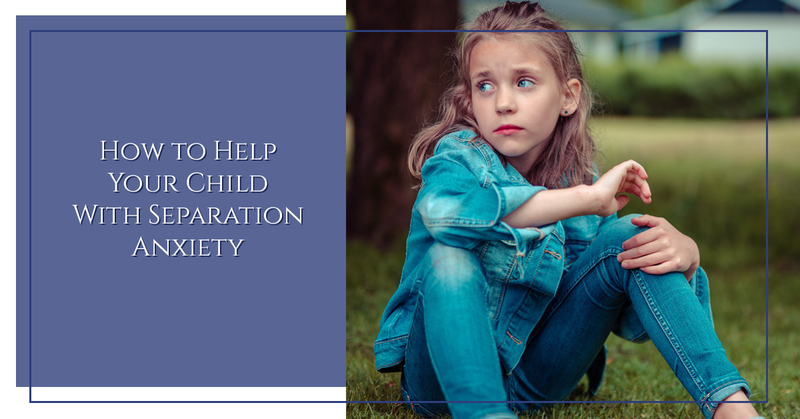 A child with separation anxiety disorder may have intense fears about terrible things happening to their loved ones, or that they will somehow become permanently separated. They may refuse to go to school or to sleep. They may also experience physical symptoms of anxiety, such as headaches or stomach aches. Alternatively, if these anxiety symptoms seem to develop overnight, it could be related to a traumatic event rather than typical separation anxiety. While the symptoms can be the same, they are treated quite differently. If you suspect or know that your child has recently experienced trauma, it’s best to bring them in for child counseling in Palatine as soon as possible. Leave without fuss. Don’t feed your child’s anxiety by making a big deal every time you leave. When you are departing, make sure not to create too much fanfare. Be consistent. If you promise to be home at a certain time, make sure you follow through. This gives your child the confidence that they will be able to survive the separation. It also helps your child feel safe and secure if your schedule is consistent, so try your best to find a routine and stick to it. Find consistent child care. Having a consistent childcare provider can do a lot to ease your child’s anxieties and help them adjust to separation more readily. Keep calm. If you are calm during separation, your child is significantly more likely to also be calm. Set limits. Setting limits gives your child clear expectations of what is going to happen. While you should communicate respect and understanding of your child’s feelings, it’s also a good idea to set clear rules for the household so your child can know what to expect. Give choices. While your child can’t control when you stay and when you go, you can give them some sense of autonomy by giving them simple choices. For example, you can give them the option where at school they want to be dropped off, or what toy they take with them to daycare. If your child is experiencing separation anxiety that seems to go above and beyond what’s typical, they may benefit from child counseling in Palatine. Contact New Transitions Counseling Center to schedule an appointment today.